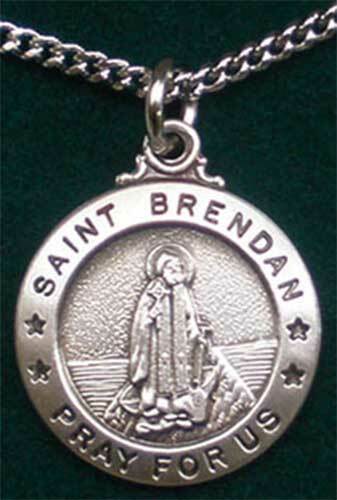 St. Brendan Pray For Us is embossed on this Irish saint medal. This sterling silver Irish saint medal features a detailed embossed depiction of St. Brendan on his boat with a Celtic cross in his hand. The dimensional pendant measures 3/4" diameter and includes a 20" long rhodium plated chain. The St. Brendan the navigator necklace, from The Irish Gift House, is received gift boxed; it is made in the United States.